A new generation Colorado dispels an old way of building small trucks. 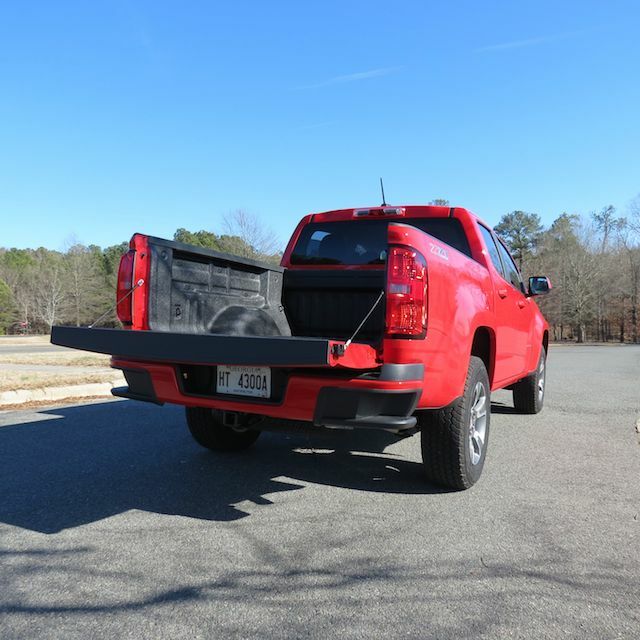 A red hot 2015 Chevrolet Colorado Crew Cab, Z71 edition. General Motors cancelled the Chevrolet Colorado and the similar GMC Canyon following the 2012 model year, offering vague assurances that they would be back in the game some day with all-new, vastly improved models. The GM pickup duo, along with the Ford Ranger and Dodge Dakota, left a chasm in the small truck segment, one eagerly filled by the two remaining trucks: the Toyota Tacoma and Nissan’s Frontier. Well, after a two-model-year hiatus, the Chevrolet Colorado and GMC Canyon are back and they’re simply superior than before. What you have here is a pair of authoritative medium-sized pickup trucks, with both offering compelling alternatives to the competition. GM could have hit a two-bagger with these models and still succeeded, but they went to the fence and have brought home a pair of winning runs. This January, GM was gracious to hand over the keys to a 2015 Chevrolet Colorado 4WD Z71 Crew Short Box model for my testing. The only model more expensive than this one is the long bed version. 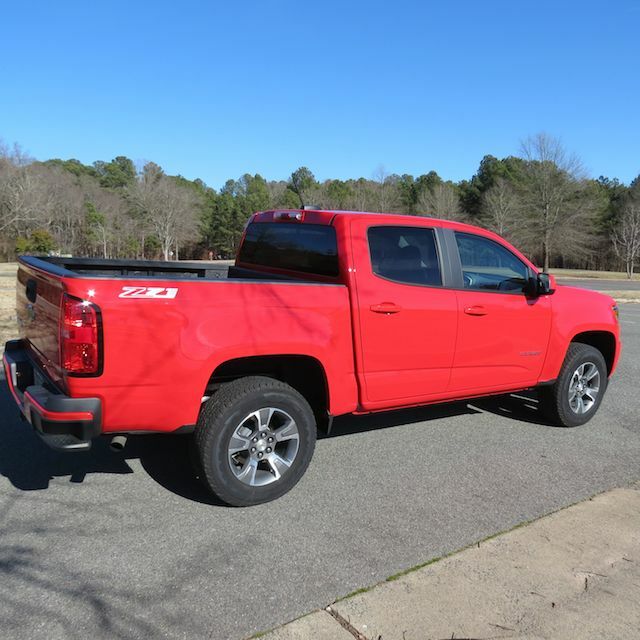 Still, at $34,115 and $36,710 fully equipped, the supplied Z71 pushes the pricing envelope. 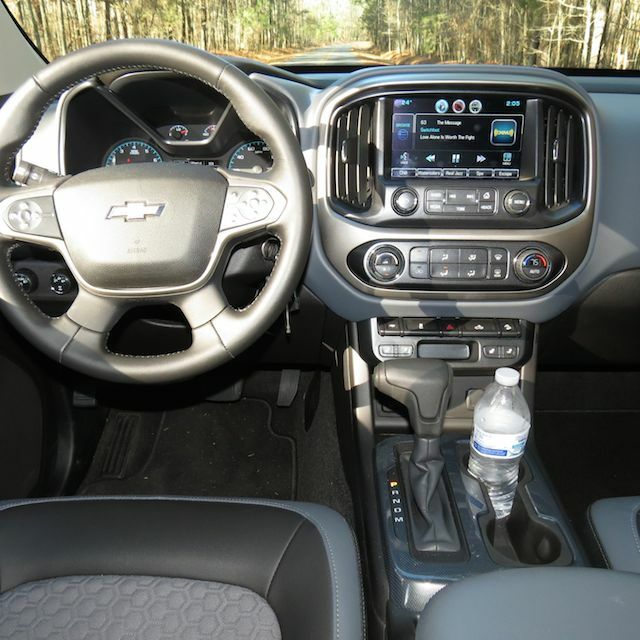 My test model came with four packages or options: a Bose audio system ($500), Chevrolet MyLink ($495), a spray-on bedliner ($475), and a trailering equipment package ($250). Just for giggles, I launched the Chevrolet Colorado configurator and added $4,570 worth of options to comprise the components found in my truck, in addition to various supplementary items. These included: a tonneau cover, an exterior convenience package, a divider package, and a sliding rear window. At this point you’re staring at a truck costing $39,860. And that was before destination, taxes and tags were added. You mustn’t allow the lofty valuation to chase you away. Sold in extended cab and crew cab configurations, the base extended cab, long box 4×2 model is priced from $20,995. Crew cab short box models are priced from $25,205 and crew cab, long box editions retail from $26,725. Therefore, if you want a 4×4 with an acceptable amount of standard equipment, an LT edition can be had for $30,095. Chevrolet sells the Colorado in base, WT (work truck), LT and Z71 editions. What sets the current pickup truck apart from its predecessor is, well, nearly everything. The latest rendition has a fresh face, more akin to Chevrolet’s contemporary design language. The trademark golden bow tie emblem is centered within a multi-slat horizontal grille. Available projector beam headlamps, fog lamps, a lower grille opening and hood creasing give this truck a muscular persona. That athletic demeanor is further amplified by the Colorado’s strong shoulders, squared wheel wells, upper and lower profile characteristics, a sloping hood and a modernistic rear bumper with side steps. A collection of tire and wheel choices add to the flair. Distinctive Z71 badging on the grille and rear side panels provide emblematic touches. It is a pity that no manufacturer offers a regular, two- or three-placement cab in this segment these days. Go back in time when small trucks were true compacts and that is all you got — with the occasional extended cab appended. These days, the extended cab is standard, but manufacturer advertising naturally insinuates that you want a crew cab. They’re probably right too: the extended cab only offers token rear seating and room, while the crew cab model provides room for three. Up front is where the seating is most comfortable. 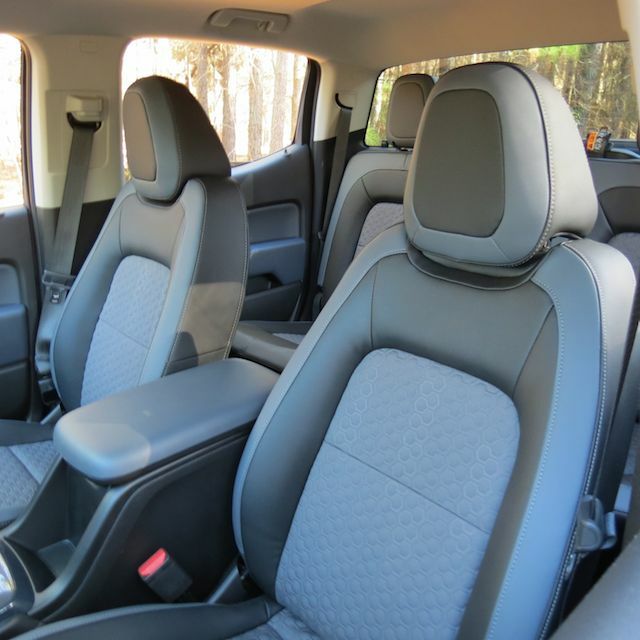 Bolstered bucket seats offering very good back, hip and leg support are present. 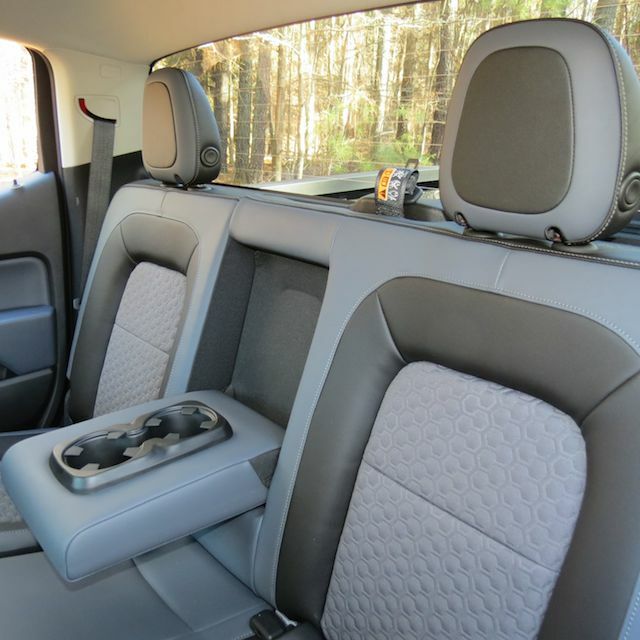 That’s not to say that the rear 60-40 folding bench seat is a penalty box, but if you’re talking about adults riding in this truck, then the back seat is tight for three, adequate for two and best used with the armrest folded down and the cup holders at the ready. Up front, you get available heated and cooled seats, a tilt and telescopic steering wheel column, an instrument panel with four analog displays — two large tachometer and speedometer readouts and two smaller gas and oil gauges. Positioned in the middle of it all is the requisite digital driver’s information center. The leather-wrapped steering wheel comes with cruise and auxiliary driver controls. To the left of the steering wheel and fixed to the lower part of the dashboard is the headlamp and drive mode knobs. The latter defaults to “2” for the standard rear-wheel drive. Also, there are two settings for high and low four-wheel drive. Except for the toughest conditions, you’ll probably stick with the higher 4×4 setting. Underneath the big and brightly link touchscreen Chevrolet MyLink infotainment display are switches and knobs to access audio, media and navigation. Further below are knobs and switches for the climate control system with additional switches controlling trailering, traction control, bed lighting and hill descent. Moreover, for trucks so equipped, seat heating and cooling switches are also at hand. At the bottom of the console is an open storage compartment, suitably sized to hold your smartphone. USB, auxiliary and 12-volt outlets are also present. Between the seats is the transmission shifter, two cup holders and yet another open storage area for a smartphone. Open the deep armrest and you will find another USB port. Although moderately confined, the storage area was sufficient for holding my camera case. At the rear of the console and facing the back seat is an additional open storage space accompanying a pair of charge-only USB ports. Chevrolet supplies overhead storage, seat lights and illuminated visors. All four doors have storage compartments with drink holders. The truck bed has four tie-down hooks. A pair of tow hooks are up front. Passionate Chevrolet fans are cognizant that a 2.8-liter turbo diesel four-cylinder engine will be offered in the Colorado, beginning in 2016. For now, the choices are a pair of gasoline engines. First, you have a 2.5-liter, four-cylinder engine making 200 horsepower and 191 foot-pounds of torque. Second, you can upgrade to a 3.6-liter, V-6 engine making 305 horsepower and 269 foot-pounds of torque. Both direct injection engines are paired with a six-speed automatic transmission. 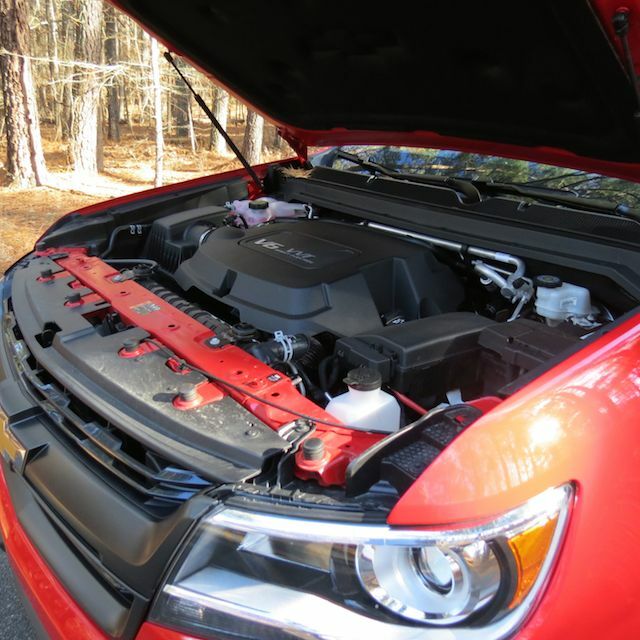 For the test model, the Z71 was outfitted with the V-6 engine. That motor offers very good off the start acceleration and imbues confidence on the road. For much of the time I operated the Colorado in 4×2 mode, switching to 4×4 while traversing gravel roads and for one all-to-brief mud slough passage. There was no quagmire here: the Colorado trampled through the fen with authority — I didn’t need to shift to a lower gear to traverse the moor. 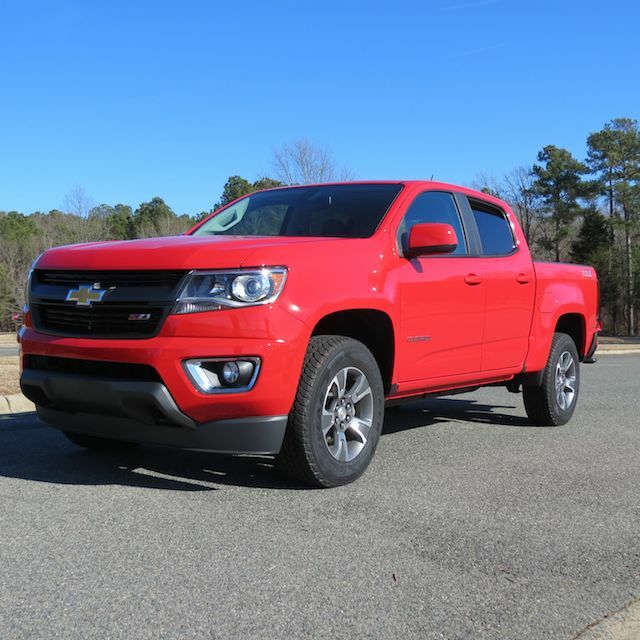 On the road, the Z71 handles much like any other large truck and that’s a marvelous thing: the Colorado behaves more like a junior Silverado with its high profile, energetic engine and assured handling. The suspension system is aided by an independent arrangement up front and by leaf springs at the rear. Small pickup truck owners are extremely brand loyal, therefore Toyota Tacoma and Nissan Frontier owners aren’t likely to transition to Chevrolet in significant numbers. What this truck does is augment Chevrolet’s current offerings, to apprehend previous Colorado and S10 owners, while making a play for Ford Ranger and Dodge (Ram) Dakota owners who no longer have a new model to consider. Perhaps the most significant question any prospective Colorado owner will ask is this one: should I purchase the Colorado or make the step up to the Silverado? At least with the current models that step is a much smaller one as the two pickup trucks are more alike than they are not. 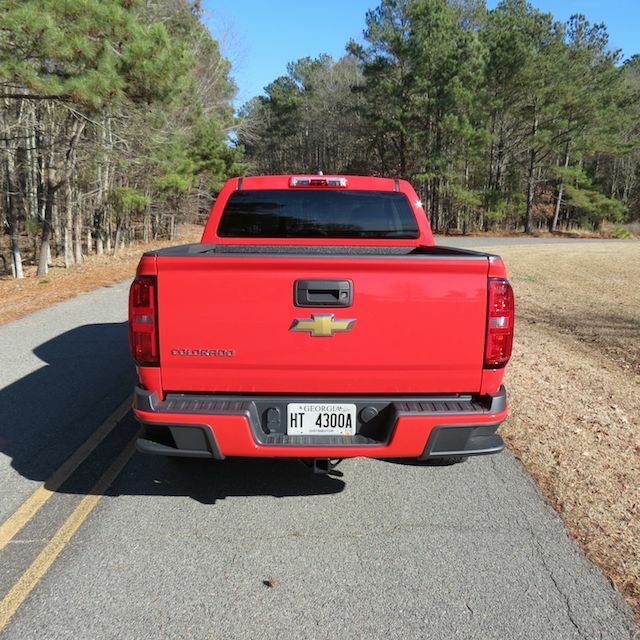 2015 Chevrolet Colorado Z71 photos copyright Auto Trends Magazine.